Brands are still struggling to get a grip on Google+. They know they “have to be there” in order to continue playing a role in social in the future. But who is there now? 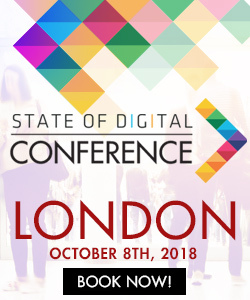 Is it, to quote a Googler last week in The Netherlands, “just the SEOs” like many SEOs claim? Or only “photographers” as many from that specific area say there are? Fact is that Google+ still needs to find some ground when it comes to usage. But that you will have to use Google+ one way or another is now accepted. But how? Many brands decide to do the same they did on Facebook: be there, be funny and interesting and get as many ‘followers’ as possible. One of the brands which is very active is the English brand Cadbury, chocolate maker and as they say themselves the “Official Treat Provider to the London 2012 Olympic & Paralympic Games”. Cadbury decided to get as many people to put them in their circles. But it looks like they might have slipped through Google’s mazes doing that. I was pointed at this by Roger del Castilho who attended a talk I did last week and who noticed that I had reshared something which maybe wasn’t all according to Google’s guidelines. So what did I share? What I thought I was sharing was something funny. Cadbury had shared a post on Google+ with an image that instantly drew my attention, simply because it was very related to the topics I am interested in and working on: Google. 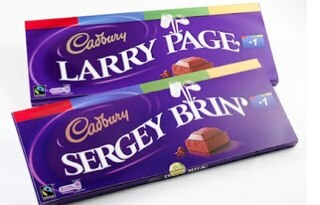 Cadbury shared a picture with chocolate bars with the names of Larry Page and Sergey Brin on it. The image is fun because it is so focussed on Google. It has the Google colors, the names of the founders and to make things complete, a plus one button on it. Cadbury had figured it could get some influence by getting as many people as possible to put them in their circles. It was the equivalent of the Facebook ‘join our community and win’. In this case they weren’t giving away an iPad or something similar though, they are giving away a branded Dairy Milk Google+ Bar. You get some chocolate! 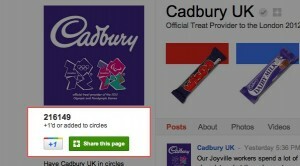 Within a day Cadbury reached the targeted 200.000 circles they wanted to be in. Nice work. But wait, isn’t that against Google’s guidelines? As said, I was pointed at this after I had reshared it. I hadn’t put Cadbury in my circles. I did however share it with my network. Del Castilho wondered whether or not this was against the Google guidelines. Although it is not entirely clear it seems as if Cadbury has gotten through Google’s mazes. They did a specific “promotion” on Google+, which is not allowed. However. The Promotion Policies are not really clear. 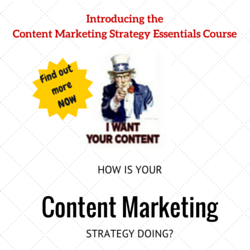 What about promoting your Google+ profile? It doesn’t say anything about that in the policy and it could very well be that Google doesn’t mind promotions which are focussed on G+. After all, this is a promotion for the product they are trying to get people to use. But if you would look at the exact letter of the law, they shouldn’t allow this. First off all: Cadbury did it just right considering the circumstances. They ‘used’ Google’s weak spot: Google+. I don’t know if they did this on purpose or not, but they did succeed. What they should have done according to the rules is put the promotion on their own website and then use Google+ to point at that. Which is a detour you don’t want, but that is what Google’s rules tell you to do. But I think they are glad they didn’t follow the rules. Now, who won that candy bar? I sure wish it would have been me ;). (original post Feb 7) I got a response from Cadbury’s Social Media Manager (who did his job well 😉 ) Jerry Daykin, who stated that the post talked about here was “just a teaser post – when the page hit 200,000 the competition launched properly with a link to an off page form”. They believe it was “very much in line with Google+ rules”. I am not 100% sure if they are right. By the letter of the law they might be right. However this does seem an awful lot like a competition on Google+. What we can conclude is that they have tried to find the borders and succeeded on that :).